I am responding both as a local resident and as a representative of Bristol Cycling Campaign. I strongly support the creation of this route and expect to use the route myself several times a week if it is built. On several occasions, I have observed school children (presumably cycling home from school) struggling to lift their bikes over the two kissing gates at the entrances to Rolls Royce’s field. I assume that these gates will be removed as part of this scheme, and it is essential that they are removed. Similarly the steps on the railway bridge need to be eliminated, as do the barriers in the A38 subway which are a safety hazard in poor light (risk of cyclists noticing them too late and colliding with them). We would very much prefer that the proposed motorcycle barriers are not included in the scheme. If for some reason they are retained, then a design should be chosen which minimises inconvenience to cyclists, e.g. a retractable design which is only brought into operation at times when there is in fact a problem with motorcycles. The width of the short footpath between Redfield Road and Rolls Royce’s field is very much less-than-ideal for a cycle route. We understand that in the short-term this is the only route available and therefore we support its use as an interim route. However we urge the council to continue to strive to secure a better route. A route around the perimeter of the Rolls Royce works would be both more direct and enable a wider path to be provided. Consideration should be given to providing a ramp from the west-end of the railway bridge to the west-bound platform of Patchway Station. This would greatly improve accessible access to the station from Patchway and Charlton Hayes and hence encourage more use of sustainable transport. – Provision of a segregated cycleway on the heavily-trafficked central section of Savages Wood Road (between Brook Way and Bradley Stoke Way). Parking will need to be eliminated to make space for this. There are too many pedestrians for a shared-use path to work well here. – Sign-posting and some minor improvements of routes through Little Stoke and Charlton Hayes. 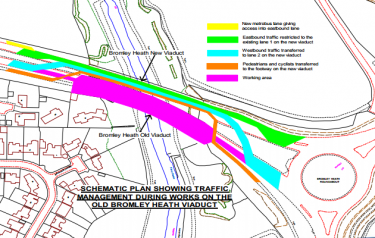 Bromley Heath Viaduct works – a cycling opportunity? 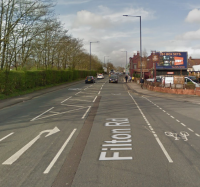 South Gloucestershire Council has secured funding via The Challenge Fund and The Cycle Ambition Fund to carry out essential maintenance works along A4174 Avon Ring Road between the A38 at Filton and the A4 at Hicks Gate. These will include improvements to the carriageway, footpaths, cycle ways and street lighting as well as structural maintenance for the Bromley Heath viaduct. The improvements aim to complement the West of England’s transport project MetroBus. Widening the southern viaduct by 2 meters by constructing a cantilever composite bridge. A wider new path will help to increase capacity and reduce incidents between path users. A barrier between the path and the carriageway, which will reduce the risk of collisions with vehicles. The scheme will provide a high standard and safer shared use facility and a two-way path. With the site anticipated to be under maintenance until summer 2018 and officials admitting significant delays over the duration of the works, thousands of people working in the North of Bristol and South Gloucestershire regions will be directly affected. The extent of the work requires the Southern viaduct to be completely closed to all traffic for the duration of the project; this is because the removal of the worn-out parts of the structure will mean it is too weak to safely carry any traffic until the maintenance is complete. All traffic (including cycle lanes) will be diverted on to the Northern viaduct. The crossover on this section could cause tailbacks of up to 8km and delays of up to 2 hours at peak times on the road network and putting stress on the M4 and M32. We are encouraging all commuters regularly transiting the viaduct and living within cycling distance to reduce the frequency of car trips and consider alternative modes of transport, particularly cycling. This is a great opportunity to engage with your employer to consider how the business is committing to green travel. Why not ask for improved cycling provisions, deals, Dr. Bike sessions and support for you and all your colleagues regularly cycling to work? At the same time, BCyC aims to scrutinise the existing plans to ensure that crossing the viaduct while the site will be under construction is safe and convenient for cyclists. Equally, we will analyse the visualisations to ensure they meet the expectations of the cycling community. Please get in touch if you want to raise an issue you experienced while transiting the viaduct on your bike. A lot of useful work has gone in to this draft strategy which follows on from the publication last year of the Bristol Cycle Strategy. As with all general plans and statements of intent they are likely to have only a slight influence on what actually happens, but they are absolutely necessary and important to get right as they make certain outcomes more likely than others. Read our full response here: 2016-01-15SouthGloucestershireCyclingStrategy. Bristol Cycling Campaign welcomes the development of a cycling strategy for South Gloucestershire and many of the aims and aspirations expressed therein. However all good things can be made even better, so here are our comments on the documents which have been presented for consultation. The strategy aims to “make cycling more attractive” and “make better places”, but this is not carried through to the rest of the strategy. Too many of the current and proposed routes in the South Gloucestershire area are alongside and close to main roads with unpleasantly high volumes of motor traffic. Making cycling attractive and comfortable by creating a more pleasant environment for cycling routes is important for encouraging more people to cycle. We strongly encourage and expect a fully integrated approach with Bristol City Council in delivering a unified and seamless cycle network across the whole of Greater Bristol. This should apply to all relevant issues including design standards, signing and routes. There should be a close match between the Bristol Cycle Strategy 2015 and the final one for South Gloucestershire. The aspirational network of cycle routes should include all those strategic and neighbourhood routes identified by Bristol Cycling Campaign as set out on the following maps South Gloucestershire North, South Gloucestershire South, South Gloucestershire Outer. This is a huge development on 143.13 hectares with up to 2,675 dwellings and apartments, employment hub, rail station, a secondary school and 2 primary schools, retail, health centres and all that goes with it. It has now been approved in outline by South Glos Council. You might hope that the planning application would be an exemplary development worthy of celebrating in a European Green Capital. You would be disappointed. There is some good stuff here but it will clearly be another car dominated development with cycling and walking at the margins. In particular there is little provision for delivering the strategic cycle routes to integrate with the rest of the city. As always, we will be insisting that every resident of South Gloucestershire, whatever their age or ability, deserves safe and inviting space for cycling, which should never be to the detriment of walking. We expect developments to deliver the main elements of the Bristol Cycling Manifesto, and specifically the strategic cycle network. We expect Triple A provision (for All Ages and Abilities) as outlined in Making Space for Cycling. Does this measure advance the six themes of 1) Protected space on main roads; 2) Remove through motor traffic; 3) Safe routes to school; 4) Cycle friendly town centres; 5) Cycle routes in green spaces; 6) 20mph speed limits? Does this measure seek a genuine reduction in danger for all road users by identifying and controlling the principal sources of threat? Will this measure be attractive to all ages and abilities using all kinds of cycles? How does this measure contribute to the development of Bristol Council’s planned integrated and coherent strategic cycle network? How far does this measure provide for Triple A Space for Cycling in the future? UPDATE 23/4/15: Final BCyC submission sent in, BristolCyclingCampaignResponsetoConsultationHarryStoke. There is a ‘pre-application’ consultation on the strategic master plan from the developers Crest Strategic, which affects the land at East of Harry Stoke. This is a huge new development on the remaining open land by Stoke Gifford bounded by the M4, M32 and the Filton Road. See our Neighbourhood page for that area for some of routes and points that need to be delivered. We’ve been plugging away trying to get the appropriate planning guidelines in place as set out in June 2014. We have significant concerns that this is another car dominated development suited to the 20th century but taking little account of Bristol’s ambitions as a Green Capital ‘where cycling and walking are so easy that everyone does it’. We’re still working on our response so do chip in through Facebook, Yahoo or Twitter. There are also our action groups. Routes to Parkway station, UWE, MOD, schools and surrounding areas must be to a high standard. This means a single network for cycles suitable for All Ages and Abilities (‘Triple A’) from kids, to grandparents and fast commuters. It will not be acceptable to provide hopelessly inconvenient, discontinuous, poorly maintained, shared use pavement cycling for some, and a bit of paint on fast busy roads for others. In other words South Gloucestershire must start to apply the principles of Making Space for Cycling. They refer to ‘low vehicle speeds within the development’ but have not specified what that means or whether a piecemeal or a ‘Total Twenty’ approach will be followed. The new ‘Stoke Gifford Transport Link’ will introduce a further significant barrier to movement in an area already hemmed in by motorways, fast roads and railway lines. The part of the Q11 South Glos Quietway from Hambrook to Bristol Parkway is missing. There is no commitment to deliver high quality ‘Triple A’ (All Ages and Abilities) improvements on the existing sub-standard elements of the F14 Outer Ring Orbital, the Winterborne Link, or the Filton Road Link. There is a worrying reference to ‘pedestrian/cycle facilities’ on the Old Gloucester Road. This will be a major commuting route and so must be properly separated and with adequate capacity for thousands of trips a day. This is possibly the one chance in a generation to get these things done properly from the start. Our initial position on the plans is to Object, with qualifications.